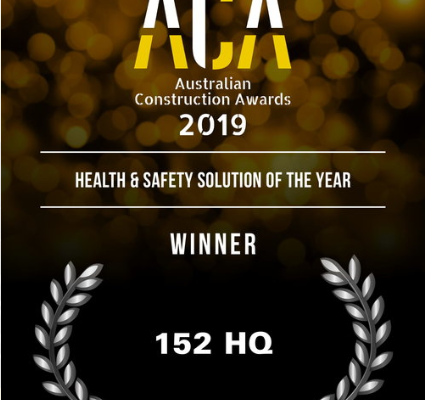 152HQ are extremely honored to be awarded Health & Safety Solution of the Year at the 2019 Australian Construction Awards. 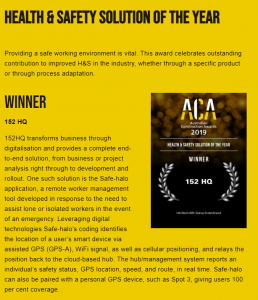 Our mantra is that everyone goes home safe, and by using existing tools that everyone has, Safe-halo is able to make safety accessible to all. I was fortunate and very humbled to have been able to accept this award on behalf of the fabulous 152HQ team. The Team’s calibre, knowledge and effort is above and beyond all expectations and I am truly thankful to work with you all. Thank you for all your tremendous efforts. A huge thank you also goes to our awesome clients. Without you, Safe-halo would still be an idea. 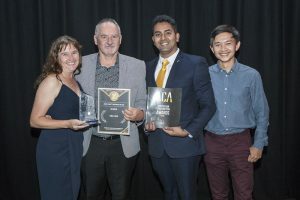 I would also like to extend thanks to the judges and organisers of the Australian Construction Awards. Safe-halo is a cutting edge remote worker management system. Protect and monitor your workforce today. Take our free 30-day trial today! The information contained within this blog is of a general nature only. It does not take your specific needs or circumstances into consideration. You should look at your own situation and legislative requirements before making any decisions.